Prisoner Horde is an Enemy in Demon's Souls. They attack at medium to long range by firing a Soul Ray, and at close range with a flurry of slashes which deal substantial physical damage and rapidly deplete stamina when blocking. It is not recommended to engage them at close range without an extremely strong attack prepared, as Prisoner Hordes do not stagger. 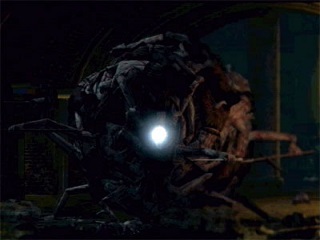 They appear only twice in the game, once in the basement of the Prison of Hope, and once in the swamps far below the suspended streets of Latria, making them on of the rarest non-boss enemies in the game. Arms around its lower hemisphere will raise swords and start swinging wildly. Will kill / wear down players' stamina very quickly if blocking and subsequently kill them. The Prisoner Horde also crawls towards the player very slowly during this attack. Charges up a large Soul Ray spell. Deals significant amount of Magic damage. The player encounters the Prisoner Horde twice, and he is avoidable each time. He looks like a big gray spherical mass of bodies. At long range he charges up a blue Soul Ray spell. At close range about six swords appear around him and start swinging wildly as he walks on his stubby legs. I suggest just taking him on at range with arrows or magic. It takes a while, but he gives decent experience. The one in the bloody swamp of Fool's Idol Archstone is protecting some Mercurystones. There is also a Fragrant Ring (MP Regen) located nearby. The Prisoner Horde in Tower of Latria is very easy to kill. There is a pillar directly in front of him, which blocks his attacks. Stand behind it (about halfway between the pillars in front of you and behind you) and shoot him. His left side will be exposed, so aim toward your right with arrows or magic. He'll never hit you. The one in Fool's Idol Archstone is easy to kill with a bow. Just hide behind some nearby debris and shoot it with arrows between its ranged attacks.